Please accept my thanks for an excellent stay at your hotel during our short vacation in the Ottawa Valley area. We were most impressed with the beautiful countryside scenery and the town of Carleton Place is quaint, historic and friendly. The architecture is really impressive and the ‘towns folk’ are friendly, inviting and they really made us feel welcome. 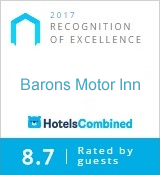 The main reason for this email is to acknowledge the wonderful atmosphere you have created at your Baron’s Inn hotel. From the moment we met the owners (husband and wife), we felt welcomed and actually, we felt like friends. The rooms are simple, comfortable and especially, clean. It seems the staff are well trained to clean everything and we had no concerns about our stay. The owner provided excellent directions and suggestions for things to do and places to see. His knowledge of the area served us well and he also recommended good restaurants in the area. We also noticed the owners interaction with other guests and he is consistently helpful and accommodating with everyone. We recommend this place to all travelers (business and pleasure). and we will return to this place the next time in the area. Wayne E. Strong, President, W.E.S. Consulting Inc.